Did you know that roadrunners can run up to 17 miles per hour? It is the State Bird of New Mexico. Roadrunners don’t fly very often. They fly close to the ground when they are going down hill or sense that a predator is near, but they can only stay off the ground for a few seconds at a time. 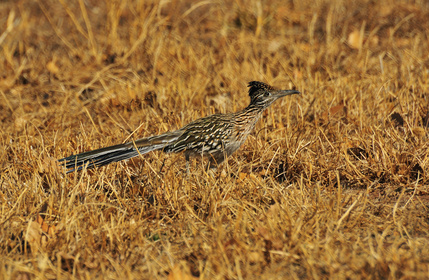 Roadrunners mostly eat scorpions, lizards, insects, rodents, snakes, and other birds. They do eat plants in the winter when there aren’t a lot of animals around. One of the coolest roadrunner facts is that they hunt, kill, and eat rattlesnakes! They hunt by using their wings like a bullfighter uses his red cape. Then the roadrunner grabs the rattlesnakes tail and whips it around and around, hitting it on the ground until it’s dead. To make a nest, roadrunners use sticks and twigs. Usually females want to have it in small trees and bushes where she lays 2-12 eggs. The eggs hatch between 18-20 days. The roadrunners that hatch last are called runts, and sometimes the parents eat them.